Gel coat wax: fact or fiction? 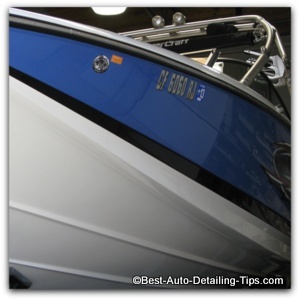 Does gel coat wax really offer a better alternative to protecting and enhancing your boat? Or can car waxes be used on your boat as a safe alternative to a dedicated boat wax or boat sealant? Many boat owners want to know if fiberglass boat wax is really different than car wax, or is this just another example where the industry re-labels the same product in order to separate you and your money yet again! Even as a veteran professional detailer, I too must closely examine product labeling in order to determine exactly what I am getting, and if the product in question offers the kind of performance and value I am after. Just like car care, boat care is a topic that has many boat owners like yourself confused and frustrated, to the point where many of us feel like the industry has us chasing our tails. "Darren, I am tired of trying to figure out the difference between car wax, gel coat wax, or fiberglass boat wax. Is there a difference and what do you recommend as a professional?" In order for you to start making informed decisions when it comes to protecting your boat from the elements, first we must apply some understanding. Since many people mix and confuse taking care of their boat with taking care of their cars, we must start here as this will help you in understanding that indeed there is a difference between a top rated car wax and a top rated gel coat wax. "Understandably, many people assume that boat gel coat is very much like taking care of the paint on their cars, but the fact is that fiberglass gel coat is very different from the paint on your car that has a clear coat on it." Understandably, many people will put car care and boat care in the same category and apply the same products and techniques to both. The reality is that while most products are indeed interchangeable, the fact is that gel coat material is very different than the clear coat on your car. Gel coat is the top layer of material used in building boat hulls and decks. Fiberglass is really the fiberglass cloth used in conjunction with a two-part resin that creates the strong foundation in which gel coat makes up the last, or top layer of your boat. This is where people get confused and use incorrect terminology. Gel coat is porous and oxidizes easily when exposed to the elements. Gel coat needs protection to prevent oxidation, dulling, and general assaults boats must endure when exposed to the elements of weather; boats need to be waxed just as cars need to be waxed. Essentially, gel coat boats and RV's are like taking care of your bathtub in your house. Basically the same molding process and same materials used. Now that we have a basic understanding of gel coat and the need for protection, the very next thing is learning the difference between wax products and synthetic sealants. Wax: As a rule, any product (whether this be cars, boats, RV's, etc.) formulated with any form of natural wax ingredients such as carnauba wax, will be correctly referred to as a wax. Waxes can come in paste, liquid, or spray. Sealants: As a rule, any product formulated using synthetic ingredients will be correctly referred to as a sealant. With that said, there is an almost endless amount of what is called hybrid products that contain both natural wax and synthetic ingredients and will be labeled based on the manufacturers discretion. Most boats will have some level of oxidation to them and therefore any traditional boat wax or car wax will prove ineffective and problematic at a minimum; this also includes any sealants whether they are labeled marine grade sealants or Teflon sealants matters not. If your boat or RV has any form of oxidation to it, you will either need to use a boat cleaner wax or get a complete boat polishing system. If you have a boat that is either in pristine condition, or is brand new, then you can decide between using a boat wax or a boat sealant. Most boats will have some level of oxidation to them and therefore, most boats will require the use of a cleaner wax at a minimum, or heavy duty gel coat restoration process at worst. "O.K. Darren, we get it; boats need protection and now I understand the difference between a wax and a sealant. 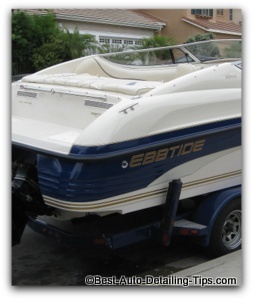 My boat is brand new and I know there is no oxidation to it, so which is better...a wax or a sealant?" Doing something is still better than doing nothing. Meaning, if you can't decide between a gel coat wax or a gel coat sealant, just pick one and figure it out later; at least your boat will have some protection to it! I believe synthetics in most areas of life have the advantage over their natural based counterparts. And this only becomes more significant over time as technology advances. Boat Waxes: Those of you boat owners out there commonly referred to as "old school", then you very likely have come to accept a quality paste wax as the only way to go when it comes to laying a foundation of protection on the gel coat. 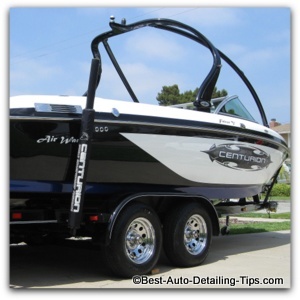 Boat waxes in paste form just like car waxes in paste form will provide the best visual enhancement when compared to a liquid wax or liquid sealant. But most boats are mostly white in color and visual enhancement usually falls very low on the priority list as opposed to protection and durability. Once again, most boat owners are looking for ways to wax as little as possible. Which leads us into gel coat or boat sealants. Boat Sealants: As I stated earlier, I am of the opinion that synthetic products offer an advantage over their natural ingredient based counterparts. From synthetic engine oils to synthetic materials of any kind, it does seem that the chemically engineered synthetic products offer more benefits overall. So based on all the compelling evidence, I am a fan of synthetic gel coat sealants vs. their gel coat wax counterparts. Human nature dictates that old habits and thinking don't change easily with people. For this reason I am going to offer my professional choices for the best gel coat wax products along with the best gel coat sealants. If you are part of the "old school" group of seasoned boaters, then choosing one of the quality paste waxes below will likely be the winning choice. Meguiar's M6332 Flagship Premium Marine Wax - 32 oz. Meguiar's has long been a trusted name. Contains mild chemical cleaners despite this not being a true cleaner wax product. Will add greater shine and depth to any colored boats. Unless your boat is either brand new, or is in pristine condition, I always recommend a cleaner wax for use on gel coat versus a wax or sealant only product. Despite what you may think, virtually every boat is going to have some level of oxidation to it. For this reason I always recommend and reach for a cleaner wax myself whenever waxing a boat. Another quality product from Meguair's. Gel-Gloss RV Cleaner and Wax with Carnauba - 32oz. Another top rated gel coat wax that also has a cleaner to it. There isn't an area of life that advances in technology, manufacturing, and chemical engineering have not made our lives easier with products that continue to get better and better. Gel coat waxes and sealants are no exception. And with that said, I am a personal believer in the latest in synthetic sealants that will allow you to wax less often rather than more often when it comes to big duty jobs like boats, RV's, and planes. Gel Coat Labs Marine & Boat One Step Gel Coat Micro Polish & Mirrorlike Shine Sealant, 16 fl. oz. Reduces slow fade induced by UV lighting. 100% marine grade synthetic sealant. Meguiar's M21 Mirror Glaze Synthetic Sealant 2.0 - 16 oz. The trusted name of Meguiar's. Ideal for use on any car, boat, RV in good to excellent condition. Once again, as a rule I am always going to reach for a wax or sealant that has an actual cleaner to it. Experience has shown me that virtually every boat (even those stored in doors) will have some degree of oxidation. I offer this for those that have brand new boats and want a synthetic sealant over that of a gel coat wax. Navigating within the world of car care and boat care is tricky and frustrating at best. Not only will you find endless contradicting opinions among the many car, boat, and RV forums, but ask any of your neighbors or friends and you will only be further frustrated. Even as a seasoned veteran of professional detailing, I am continually frustrated by the many forms of misleading advertising and product labeling. With that said, it doesn't mean that there is not a shortage of quality products, and just because a manufacturer is less than honest in labeling and marketing doesn't mean they still don't have some exceptional products that continue to get better and better. Most boats will require the use of either a cleaner wax, or a dedicated polish to remove oxidation first, before applying either a boat wax or a boat sealant. If you have a boat in excellent condition, I personally prefer a liquid sealant over the gel coat wax products; they are easier to use and provide a slickness unlike a traditional paste wax that I find appealing. Good luck in your efforts!